The Micro Farm Project has a gorgeous night blooming Cereus cactus outside our front door. For fourteen years, I admired its blooms, but did not realize that the bright pink fruits that were left after the blooms faded were edible...and DELICIOUS! The white interior is lightly sweet and practically melts in your mouth, with a slight crunch from the tiny seeds. 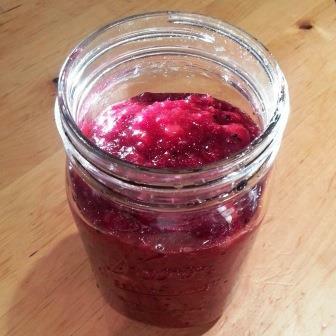 I love all sorts of fruits and fruit spreads, and one of my favorites is cranberry jam with pears or apples. I was curious how the recipe would taste with the addition of some of the fruits from my cactus. The result was a gorgeous roseate jam that was tart and sweet and heavenly. This jam is bright and cheerful, and so versatile. It tastes lovely on English muffins or pancakes; it makes a tantalizing sauce for turkey and pork; and I have even used it as a drizzle over chocolate cake. Yum! Here's how I made the jam. You could substitute dragonfruit or Nopale tunas (yes, that's a fruit!) for the Cereus fruits. OR replace the unusual fruits with peeled apples or pears, if you do not live in an area where cactus fruits are available. Cut cereus fruits in half and remove the pulp. Discard the skin. Place all ingredients in a medium saucepan and bring to a boil on medium-high heat. Reduce heat to medium-low and simmer, stirring frequently, for about an hour. Keep covered while simmering, leaving only a little crack for the steam to escape. Transfer into a blender or food processor and puree until smooth. Let cool completely and transfer to a medium jar. For more info and photos of Cereus cactus and Cereus Cranberry Jam preparation, visit TheMicroFarmProject.com. Have you eaten or cooked with cactus fruits? Share your experiences and recipes here.